Each Battery Container includes: Instruction Guide and details of acceptable products. 190mm high x 210mm Diameter. 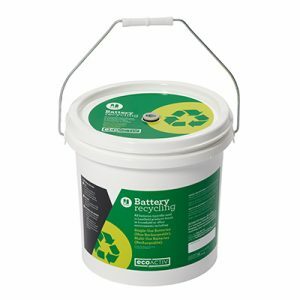 The EcoActiv Battery Recycling service provides a low-cost, consumer friendly solution for keeping batteries out of landfill. It also helps to recover non-renewable resources for use in the manufacture of new products. Alkaline batteries including AA, AAA, C and D sizes, and rectangular 6 and 9 volt batteries. Button cell batteries used in watches, cameras, toys, clocks and other small devices, comprising Lithium, Silver Zinc and other chemistries. Batteries used in handheld products and devices including Nickel Cadmium (NiCD, NC), Nickel Metal Hydride (NiMH, NM), and Lithium Ion (Li Ion) chemistries. Recycling globes and tubes through EcoActiv is straightforward and user-friendly. Subscribe – Purchase the prepaid EcoActiv Recycling service from our online shop. 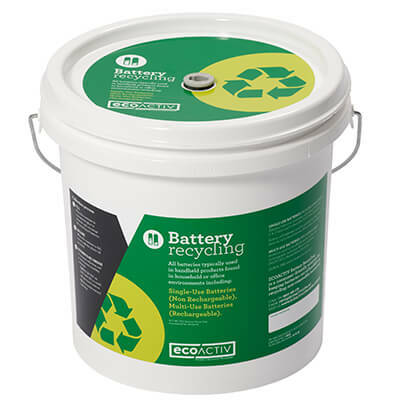 Once your order has been processed, an EcoActiv battery collection container will be dispatched within 5 working days. Fill – Place your Collection Box in a prominent to promote and encourage the recycling of batteries. Secure – When the container is full, secure with the plastic lid provided. Return for recycling – Call EcoActiv on: 1800 489 278 or email: info@ecoactiv.com.au to arrange a pick-up for your full container. Repeat – Purchase a replacement collection box from our online shop to continue recycling your globes or tubes with us. Batteries collected through EcoActiv are safely transported to a specialist facility where they are sorted by chemistry or battery type. Depending on battery chemistry, they are subsequently transported to local and overseas recyclers under strict standards, guidelines and approvals for processing and materials recovery. As community awareness and collection volumes increase, local processing of alkaline and lithium batteries may become commercially viable. 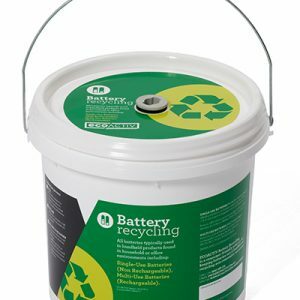 The EcoActiv Battery Recycling service is operated by Infoactiv Group, a specialist product recovery and environment stewardship organisation that is focused on environmentally sound supply chain solutions for consumers, business and government agencies. Infoactiv is a member of the Australian Battery Recycling Initiative (ABRI) and has adopted the ABRI Packaging guidelines for used handheld batteries. For more information about ABRI look here. A distinguishing feature of the purpose-built EcoACtiv Battery collection container is the Micro-Porous Gause Vent that allows venting for either pressure or vacuum relief. This provides an added level of storage safety by way of allowing any build of gases to easily and safely escape. Batteries are potentially hazardous, so they need to be stored and handled carefully. They need to be kept out of reach of children. Some of the materials are toxic, so you need to be careful of damaged or broken items.